The Industrial Heritage Group is for members who have an interest in our industrial heritage of trains, cars, planes, bikes, early manufacturing etc. to visit museums, railways, factories and other places related to our industrial past. We occasionally take a quite broad view of what constitutes "Industrial Heritage" if it is of interest to us! Travel arrangements vary depending on how far we have to travel, but generally we meet in Ashby to car-share. Wed 15th May 9.30 at Featherbed Lane Belper North Mill tour plus walking tour of Belper Bill Wilson NOTE this is a week earlier than normal. A38 and A6 to Belper. Drive through the town, at the lights take A517. In 100 yds, pass under archway and CP is 1st on the right. Arrive Strutt's North Mill for 10.30 for coffee. Tour starts at 11 am for 1 hr followed by a guided town walk for approx 90 mins. Lunch booked at Green House pub in King St, Belper for 2 pm. Pay and Display CP behind pub. The walking tour is expected to be quite gentle and slow. The tours are £5 per tour/pp. Sat 29th Jun TBA Cragside House and gardens, Northumberland Mike Stow Saturday 29th June to Monday 1st July. The first house in the world to be lit by hydroelectricity. Fantastic house and gardens worth a whole day visit. The hotel in Newcastle is now booked for 2 nights. Spend Sunday at Cragside with time on Saturday pm and Monday am to visit Newcastle town, the riverside and Discovery museum. Hotel rooms are now booked. Anyone else wishing to join us would need to book their own rooms in Newcastle. 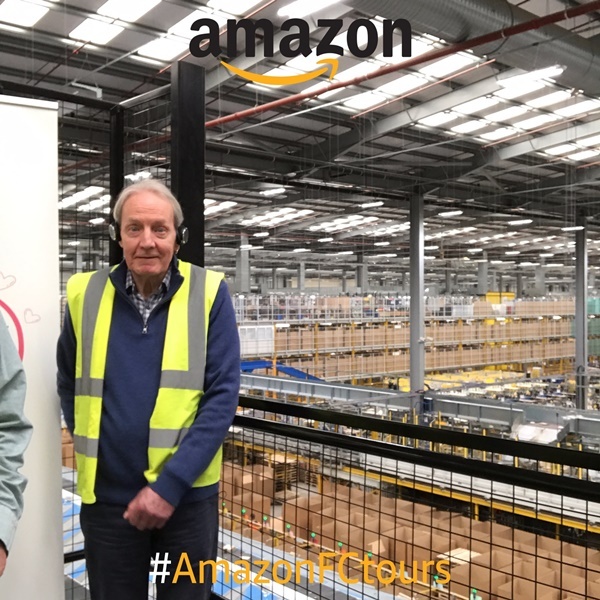 We had intended to visit Amazon at the end of last year, but understandably they don't really want visitors at their busiest time of the year and so we were put off until March. The building, opposite the power station at Rugeley is huge from the outside although impressively disguised by being painted in horizontal stripes of progressively lighter shades of blue. On arrival we were greeted at the door by our guide Gavin and his assistants who gathered us in a reception room to give us the obligatory safety briefing and to equip us with our "gilets jaune" (dayglo yellow vests) and headphones so that we could hear Gavin above the noise of the machinery. It was noticeable right from the start that they take security and safety seriously. All staff have to pass through security scanners on entry and departure and nothing unwanted is allowed in or out. Once on the warehouse floor, we were led straight up to the 4th floor of the huge storage area. Gavin explained that every new item stocked by Amazon is first weighed and measured so that the computer system knows how big and heavy it is. Items are then scanned and randomly placed on the shelves (the location is also scanned!) so that popular items are scattered throughout the shelves. This stops bottlenecks forming with all the pickers wanting to go to the same place to pick up the latest computer game, book or DVD. When an order is received, a picker is despatched to collect the item, put it in a plastic tray and place it on the huge conveyor system. If someone has ordered multiple items these are diverted to a holding station until all the items are together. They then go to the packing area where the computer tells the packer what size box is needed and provides a barcode label describing the destination address, the couriers name and the delivery date. The filled box is then scanned again and checked that it is the correct weight (i.e. the right objects are inside) and adds a printed human-readable address label. It then goes to the dispatch area where trucks take everything to the couriers' distribution depots. Barcodes are used everywhere to keep track of where everything is at any time. As we walked around it was noticeable how few people were on site. Although apparently they employ some thousands of staff, the operation runs 24/7 so only a fraction of the staff are present at any one time. And the building is HUGE. It might look big from outside, but inside you can't see from one end to the other!. There are 18 Fulfilment Centres in the UK alone, and this isn't their biggest Centre by far. Amazon now offer an express same-day delivery option in certain areas. Rugeley used to hold the record for the fastest delivery, from a customer placing the order to delivery at their house in just 13 minutes!! A truly interesting morning's introduction to the world of Amazon. And we got a free gift.